The mortality rate from opioid overdose more than tripled from 2000 to 2015. As the Trump administration rolls out its long-awaited infrastructure plan, the reality of the skilled worker shortage will come into clear view. Skilled labor will be needed to implement Trump’s $1 trillion plan to modernize the nation’s transportation infrastructure, regardless of whether the projects are funded publicly or privately. Analysts are increasingly looking to the issue of drug abuse in explaining this problem. National survey data shows that 16.5% of construction workers admit to heavy alcohol abuse within the last month, about 12% to illicit drug use in the same period, and over 14% to illicit drug use during the past year. Workers in the related sectors of mining and manufacturing also exhibit much higher than average incidence of drug and alcohol abuse. If the Trump administration is going to be successful in stimulating these sectors, it will need to rekindle efforts to reverse the growing tsunami of damaging drug use, which is reaching a deadly crescendo as use of powerful new drugs such as Fentanyl spreads to blue-collar workers. It is no surprise that these industries are scrupulous in screening workers (almost 80% of all manufacturing companies test all new hires for illegal drug use), as workplace safety and health are of paramount importance when around or operating heavy equipment or the machines that control heavy equipment in fast-paced production environments. Driving trucks, drilling for oil and gas, or building new structures entail serious risks as well. Recent reporting confirms a worrisome upward trend in drug use. According to the most recent National Survey of Drug Use and Health, up to 48 million Americans admit to having used illicit drugs in the past year. 36 million reveal that they used marijuana, and 40% of those are “heavy users.” Marijuana use has grown by 44% since 2008, as state after state legalizes its use and public officials and elites foster a culture of tolerance. Data from the largest private drug testing firm, Quest Diagnostics, reveals more troublesome trends: heroin use is up 84% since 2011 and cocaine up 55% since 2007. More potent, and deadly, forms of marijuana and heroin are increasingly available. These numbers almost certainly underestimate total incidence of illegal drug use as they are based on self-reporting or test results for those who agree to be tested. 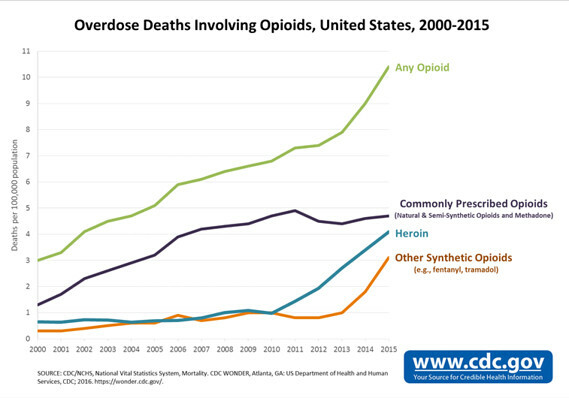 Opioid overdose deaths are now over 33,000, up 69% since 2008, and if trends persist, we will see more deaths from this source in 2017 than from auto accidents. In addition to the real and damaging health effects of drug abuse, how much of the reduction in work-force participation and increase in disability claims are accounted for by this new plague? We cannot know this without further research, but we do know that the U. S. labor-force participation rate has declined by about 4% in the last two decades. Surveys show a greater propensity for low-income and non-college-educated workers to abuse illegal drugs. Rising numbers on the disability rolls are increasingly related to drug dependence. We also know that illegal drug use is a major contributing factor to the skills shortages affecting the industrial sector. Job applicants can’t pass or simply avoid jobs requiring screening. The social breakdown linked with chronic drug use discourages them from acquiring needed skills, work habits, and the motivation to thrive in good paying but increasingly demanding industrial, logistics and construction jobs. Research by Accenture for the National Association of Manufacturers suggests that when 8% to 10% of job openings for skilled and highly skilled workers remain vacant, industrial firms have “9% less effective capacity to produce product,” much higher labor costs due to the need for overtime, and lose up to 11% of annual earnings. Moreover, in an ominous trend for the industrial sector, estimates by the journal Drug and Alcohol Dependence, which are based on analysis of emergency room visits, suggest that 35% to 40% of accidents are associated with illicit drug use. Studies have estimated that marijuana users have 55% more workplace accidents than non-users. One cannot reduce the skills shortage problem uniquely to increased illegal drug use. A cultural aversion to “dark, dirty and dangerous” industrial jobs (albeit an anachronistic notion) and to tough construction jobs, loss of market share due to global competition, technology-induced productivity increases, weak STEM education, and a deterioration in the tax and regulatory environment in the United States have all contributed to a loss of jobs and a culture of despair among industrial workers. Indifference on the part of political and educational institutions has also played a large role. But ignoring the devastating effects of drug abuse is exacerbating the problem. President Donald Trump has set out to reverse the political economy of the construction and overall industrial sectors and the culture of indifference or outright hostility to their growth. As the new federal budget takes shape, devoting attention and resources to the drug problem is also needed to reverse the cycle of personal and social decline which contributes to the shortages of labor holding back stronger economic growth.